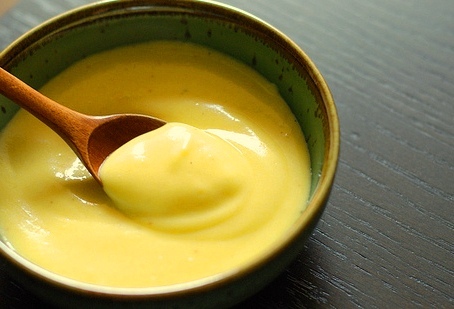 Like mayonnaise, Hollandaise and Béarnaise are emulsion sauces. Emulsion sauces are made with egg yolks, oil or fat and an acid to stablilise them. In the case of Hollandaise and Béarnaise, the fat is butter; with Hollandaise, the acid is lemon juice. Adding a teaspoon of the acid to the egg yolks before the fat is added helps prevent curdling and ensures a thick sauce. Traditionally, all emulsion sauces are made in a double boiler, but both Hollandaise and Béarnaise can be made in a food processor. To finish the sauce you will need a double boiler, or a basin sitting in a saucepan of hot (but not boiling) water. Place egg yolks, water and a little of the lemon juice in the bowl of the food processor and, using the metal blade, process until light and well mixed. With the machine switched on, add the butter in a slow steady stream. Continue to process for another 30 seconds. Transfer the mixture to a double boiler, cook at low heat, but be careful not to let the water boil. Add a little cold water to the bottom of the double boiler frequently to keep it below boiling point. Stir the sauce constantly until it thickens to the consistency of custard. Add extra lemon juice to taste, but remember, too much lemon will spoil the sauce. Stir in the lemon juice well to stabilise the sauce. Add freshly ground pepper. Hollandaise keeps in the refrigerator, but it does harden to the consistency of butter. Remove from the fridge well before serving time to soften it, or stand it in warm water. It may need to be whisked with a fork, or returned to the food processor for a few seconds. Should the sauce curdle, return it to the bowl of the food processor, switch on, and feed 1 – 2 tablespoons of boiling water through the feed tube, a little at a time. Hollandaise sauce is traditionally served with asparagus or other vegetables, eggs and fish, especially salmon.